So the Prime Minister has ‘agreed’ that the Grenfell Inquiry Panel will have two additional Panel Members. What does this really mean? The answer is in the detail or rather the missing detail! It has not been made clear if the two additional members will have equal decision-making powers to Judge Moore-Bick; how they will be selected; if there will be any community consultation or if they will be forced upon us, based on the civil servant’s perception of what they ‘think’ we want. Let me be clear here, we need panel members who understand our lived experience and can challenge key factors that adversely impact communities like North Kensington. This means panel members will have to probe and challenge the Judge in a wider context and not accept government legislation and public policy as ‘normal’, as part of the accepted status quo. For the record it does not solely mean that both panel members have to ‘look like us’. Yes, it would give more community confidence in the Inquiry, but it is not intrinsic to having the expertise we need. To put this in plain English -It is vital that the PM and Inquiry team does not select panel members who look like us but ‘act’ like them. The Stephen Lawrence Inquiry Panel’s conclusion of Institutional racism was a watershed for inquiry outcomes and drive for change. Dr Richard Stone, a Jewish GP was a panel member. Richard also had extensive experience working against racism and social exclusion. He also sat on boards in the grant making charitable sector. One of the community organisations he funded and became involved with was the Mangrove, here in Notting Hill. Richard originally came into contact with the Mangrove in his role as a GP. At a time when police brutality of black men was the ‘accepted’ the ‘norm’. Dr Stone was often the only local Doctor we could call out in the middle of the night to document the injuries inflicted by officers of the law. Richard knew first hand the lived experience of the North Kensington Communities. His presence on the Public Inquiry paved the way for increased community confidence in the process. the development of the fire and smoke; how the fire and smoke spread from its original seat to other parts of the building; the chain of events before the decision was made that there was no further savable life in the building; and the evacuation of residents. How on earth are the additional panel members going to be able to identify lessons to be learnt if they have not heard what happened ‘on the night’ in Phase 1?? What should become clear from phase 1 is that government legislation and policy over many years all contributed to what happened on ‘the night’ and furthermore, how this has contributed to everything that is wrong with our society today. We don’t experience the impact of this, as a ‘phase;’ this is a systemic degradation and bordering inhumane treatment of communities up and down the country. This is what needs to be assessed at phase 1 and it is vital that we have two additional panel members at phase 1, who are able to raise this. What is the reason for them only sitting on the phase 2 panel, could it be about pushing forward with the already agreed inquiry schedule, that is already very late? Could it be money? Or could it be that they think that anyone with ‘community expertise’ wouldn’t understand the ‘complex technical issues’. I’m no technical building expert, but I can glean that it wasn’t solely the building materials used for the refurbishment at Grenfell tower that alone caused the fire; but rather the swathe of government deregulation policy that ‘allowed’ it to happen. 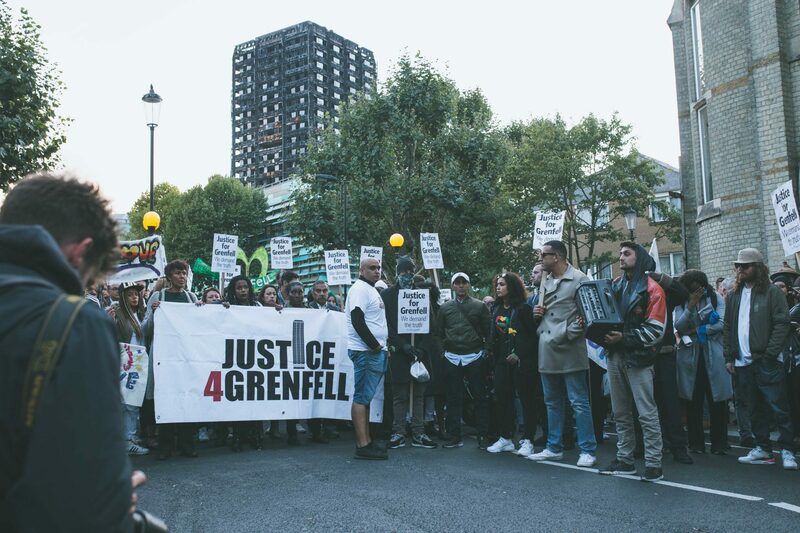 We cannot leave phase 1 to ‘privileged experts’ who talk solely about ‘technical issues.’ At least 72 people lost their lives in the fire at Grenfell Tower, many who survived still have no permanent home. As we mourn what happened at Grenfell, we don’t talk about ‘the building’, we focus on the ‘people’. It is people who form communities. It is people that will continue to Campaign in unity to interrogate this injustice. It is ultimately what links us to communities up and down the country; we are linked by the sheer nature of our humanity.